So far eight organizations and families have adopted bins, pledging to pay for regular waste collection services for one year and to conduct at least two beach clean ups at their site. Congressman Gregorio Kilili Camacho Sablan was on hand with his partnering organization, the Susupe Hi-5 basketball team, to receive certificates of appreciation for adopting the bins to be installed at Kilili Beach next week. MINA’s Chair, Fran Castro said, “Partnerships such as these are the keystone to environmental stewardship. We deeply appreciate the commitment that the Congressman and these organizations and businesses have demonstrated towards protecting our islands’ natural resources”. Other adopting organizations include: Brabu Pharmacy and Wellness Center – 13 Fishermen Monument; CTSI and Tan Holdings – Susupe Beach Park; Ericco Enterprises – Laolao Beach; Marianas Trekking – Wing Beach; The Rotary Club of Saipan – Garapan Fishing Basin; and the Marianas Visitor Authority (site not yet selected). “CTSI Logistics-Saipan is among those companies who have continuously upheld rehabilitation projects to protect and preserve the beauty of the island”, said Saipan General Manager, Rene Magalong, who learned about the Adopt-a-Bin program through the Beautify CNMI network. CTSI Logistics-Saipan’s parent company, Tan Holdings, adopted Susupe Beach in 2008. The company encourages their team members to join in cleanups by scheduling regular birthday celebrations at the park each month. Despite many activities to choose from Saturday morning, over 50 individuals from government agencies, public and private organizations and JROTC turned out to celebrate the installation of Mariana Islands Nature Alliance’s (MINA) first recycling and trash bins at the ribbon “untying” ceremony at Obyan Beach. The bins were made possible through a grant from the NOAA Marine Debris Prevention Program to “establish an island culture of recycling”. If you or your company or organization would like to Adopt-a-Bin, please contact MINA by visiting their website at www.minapapcific.org or emailing Kathy Yuknavage at Kathy@minapacific.org. 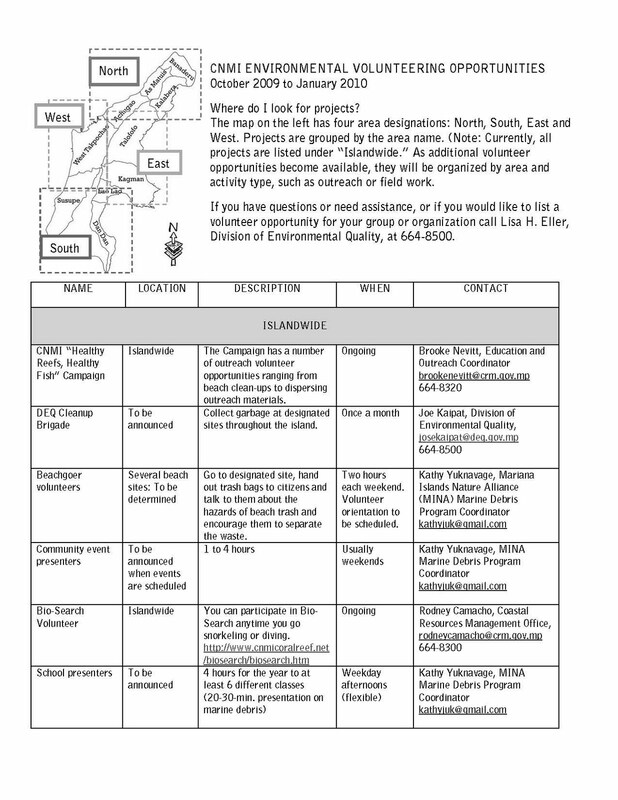 DEQ's Lisa Eller is looking for your info! 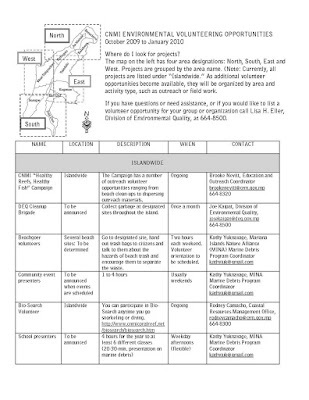 If you would like to include an entry on their volunteer listing or contribute a short (2 paragraphs) environmental story in the next Green Bulletin, the deadline is WEDNESDAY, March 31. That’s next week. 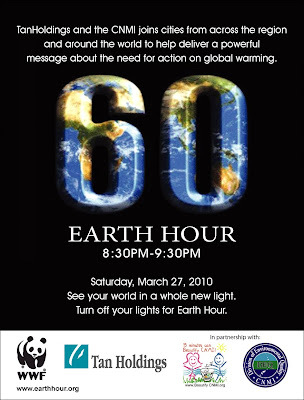 On March 27 at 8:30pm the Division of Environmental Quality encourages CNMI residents and businesses to turn their lights off for one hour, in support of the World Wildlife Fund (WWF) sponsored Earth Hour event that seeks to raise awareness and promote global action on climate change. In partnership with American Memorial Park, the CNMI Earth Hour Team is hosting a candle-lit commemoration of the event as the park lights are switched off this Saturday from 8:30pm to 9:30pm. The public is invited and encouraged to attend. In its first Earth Hour event, the CNMI will join more than 115 countries and an expected billion people world wide to raise awareness about the risks and causes of climate change as well as asking for action from world leaders on it. Being an island nation, the Northern Mariana Islands stand to be greatly affected by rising sea levels, increasing ocean temperatures, ocean acidification, and increasing occurrences of drought and large storm events. Climate change would impact local economy, infrastructure, and food production. 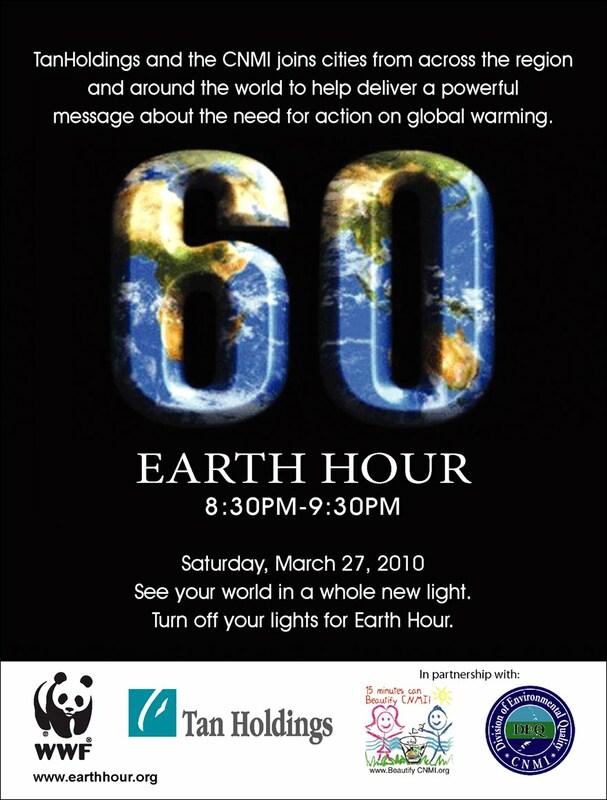 Participation in Earth Hour will allow the CNMI to add its voice to those around the world calling for leaders to make action on climate change a priority. There is a Susupe meeting set for March 24, 2010, (Wednesday) 6:30 pm, at Eric Atalig's residence by the Susupe basketball court. NW-Susupe's goals for this Wednesday's meeting are 1) to recruit new members, 2) elect officers for Susupe Village, and 3) create a public calendar of events for everyone to post and get info from. 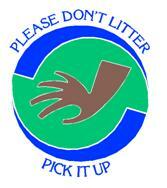 Once this is established they will begin making plans to start cleaning up the neighborhood. Eric Atalig is the village leader for the NWTF PIO/Susupe Block Captains in the Neighborhood Watch program operating out of the Saipan Municipal Council's office. Please contact Eric at ebatalig@gmail.com for more information. The Mariana Islands Nature Alliance (MINA) will be removing both real and perceived barriers to proper waste disposal at seven popular public sites this month by installing mixed waste and recycling bins at Garapan Fishing Basin, 13 Fisherman monument, Kilili Park, Sugar Dock, and Wing, Laolao, and Obyan beaches. This project, funded by NOAA’s Marine Debris Prevention Program, aims to diminish the amount of litter left on the shore that eventually washes into our ocean to become a floating “soup” of garbage. Last year’s Coastal Clean up Day confirmed what had already been observed; by installing and paying for weekly trash hauling services three years running, MINA virtually ended the litter problem once miring the beauty of Wing Beach. Chair, Fran Castro said, “The next step is to see if we can also get people at the beach to separate plastic, glass and metal from their garbage before throwing it in a bin. Recycling is the key to lengthening the life of our landfill. The more we separate, the less we have to bury”, said Castro “and what better way to establish recycling than by placing bins in public places”. 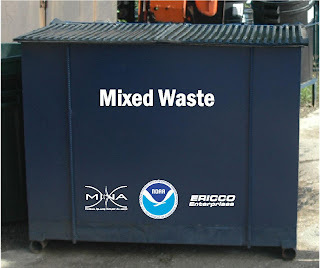 Ericco Enterprises was contracted by MINA to build the recycling and mixed waste bins scheduled for installation Saturday, March 27th at Obyan Beach. Regular trash hauling services will begin immediately. MINA has secured funding to pay for the first few months of service for the seven sites, but is asking interested individuals, families, and businesses to be part of the solution to the pollution problem by contacting MINA to “Adopt-A-Bin” and pay for one year of trash hauling services. In return, Adopters will have their name or logo placed on their bin and be internationally recognized as one of Saipan's eco-friendly and community-oriented businesses in a documentary that will be shown at the US Coral Reef Task Force meeting next year in Washington, DC. Adoption fees are 100% tax deductible. 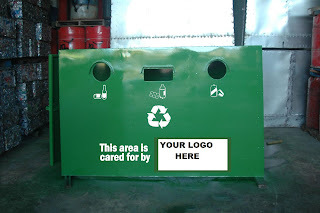 Already four bins have been adopted by: MINA, Brabu Pharmacy and Wellness Center, Ericco Enterprises, and Rotary Club of Saipan. Several other organizations have also expressed interest in the program. If you would like to adopt a bin or would like more information please contact MINA’s project manager at kathy@minapacific.org or visit the MINA website at www.minapacific.org to learn more from their Goals and Projects page about how you can prevent marine debris. (DEQ) - The Division of Environmental Quality (DEQ) cleanup brigade will be at it again, picking up trash at Cow Town Beach in Marpi. Volunteers will split into groups and go East or West cleaning the beach until 10:00 am and break for drinks and then continue, if needed. 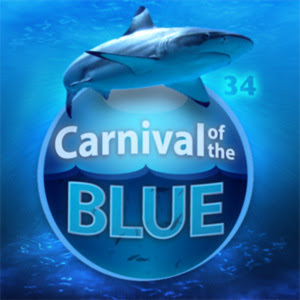 Carnival of the Blue 34 is now posted at Southern Fried Science. Carnival of the blue is a rotating monthly compilation of the "best of" ocean blogging, bringing together ocean bloggers and readers and (hopefully) using new media to build a virtual community of ocean lovers. The Carnival lives on the blogs of community members and you can visit Carnival of the Blue headquarters for links to all the carnivals since ever since.